Located at the Q-Fest Festival Ground. Blue Sky Community Garden is hosting its fourth annual Eco Fair and Farmers Market featuring eco-friendly vendors, free kids activities, educational booths, plant sales, food and beverages. The community garden will be open for tours. The garden raises vegetables for local charities feeding the homeless in Brevard. Will be held at the Suntree United Methodist Church and will be from 9:00 AM to 2:00 PM. 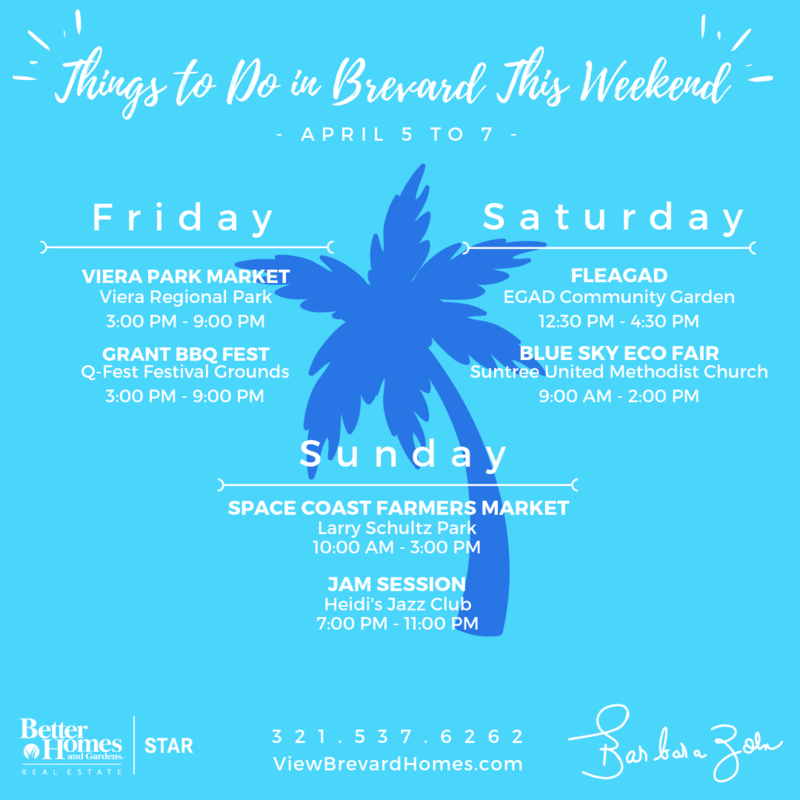 FLEAGAD Market is a community sponsored event powered by the merchants of the Eau Gallie Arts District & their supporters to enrich our unique district and invite other creatives, artisans, and entrepreneurs to join us on our journey! This event occurs every first Saturday 12:30 pm to 4:30 pm at the EGAD Community Garden. Bring your pet and children, too, and join The Animal Sanctuary (TAS), a nonprofit, volunteer organization, for Spring Tails thru the Village, in Cocoa Village. Sponsored by Tails at the Barkery, this event will help raise much needed funds for the animals TAS rescues and the building of Brevard County's first no-kill, no cage, animal sanctuary. The majority of animals who come to TAS have medical conditions resulting from neglect or abuse, some have behavioral and emotional issues, some arrive as strays, suffering from illness and injury, and all are in need of love and attention, which TAS is happy to provide. Follow the Bunny Hop Map to play the Magic Easter Eggs Game to win prizes! For a $10.00 donation, receive a goody bag and a framed 4x6 color photo with the Easter Bunny. Back by popular demand! HOTEL CALIFORNIA "A Salute to the Eagles" was founded with the intent of filling the void left by the demise of The Eagles in 1982. This highly acclaimed presentation has a great reputation and excellent references. HOTEL CALIFORNIA has become one of the most sought after acts in the world, with name recognition and true marquis value paralleling today's modern recording artists. Each concert presents an exciting showcase of the Eagles mega-hits such as “Take it Easy,” “Heartache Tonight,” and “Hotel California” as well as newer releases “Get Over It” and “Love Will Keep Us Alive.” The group also performs select titles from the solo works of Don Henley, Glen Frey, and Joe Walsh. This timeless music is appealing to audiences of all ages, bringing back memories and touching the hearts of every generation. So join us now on a trip down a dark desert highway, feel the cool wind in your hair, and experience the Grammy Award winning sounds that defined a generation. Year round market featuring local artists & crafts, delicious sweet treats, fresh from Florida produce, and fantastic soaps & lotions. Plus, local honey, beautiful plants, rocks, minerals, crystals, fossils & meteorites, an assortment of lovely jewelry and so much more! This event reoccurs every Sunday, 10 a.m. to 3 p.m. at Larry Schultz Park in Rockledge. For over twenty years, Heidi's Jazz Club has been the number one hangout for jazz lovers and jazz musicians on Florida's Space Coast. On Sundays, Heidi's Jazz Club opens their doors for an impromptu jazz session from 7 - 11 p.m. Come join the fun! Free admission except for special performances.